Modiphius unleashes the Dark Legion in the 3rd edition of the massive techno-fantasy dieselpunk RPG with brand new content & cinematic rules! 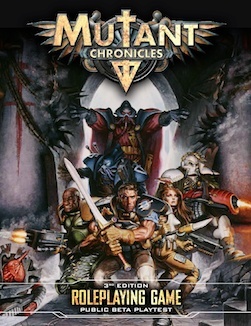 The 3rd Edition of Mutant Chronicles returns with a massive range of books including a stunning full colour hardcover 400 page Core Book in print and PDF (from August 2014) and a full range of supporting guides including three major campaigns. You can enjoy this OpenBeta with a stripped down ruleset to get a small taste of what's to come or see inside for how you can join the full Beta Test and help shape the future of the game! Mutant Chronicles, created by Target Games, now Paradox Entertainment was one of the bigger names in gaming in the 1990's with the Doom Trooper collectible card game translated in to 16 languages, three boardgames, a SNES and Mega Drive Doom Trooper video game, the massive Warzone miniatures game and the Mutant Chronicles 1st and 2nd Edition roleplaying games with more recently a Hollywood movie, Fantasy Flight Games pre-painted miniature game and last year the reboot of Warzone by Prodos Games. 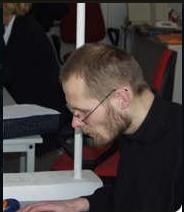 The 3rd Edition of the RPG has a stellar line of designers including Jay Little (Star Wars: Edge of the Empire, X-Wing Miniatures Game), Jason Marker & John Dunn (Star Wars: Edge of the Empire), Dave Allen (The Enemy Within, Star Wars: Edge of the Empire), Clive Oldfield (Warhammer Fantasy Roleplay 3rd Edition ), Gunnar Roxen (Broken Shield, The Wyld Hunt, The Firestorm Conspiracy), Dave Blewer (Deadlands, Savage Worlds, Achtung! Cthulhu, Sundered Skies, Daring Tales of Chivalry), Michal E. Cross (Fantasy Craft, Brandon Sanderson’s Mistborn Adventure Game, Achtung! Cthulhu), Chris Birch (Achtung! Cthulhu, Starblazer Adventures, Legends of Anglerre), Mischa Thomas (Cold & Dark), Chris Lites (Dust Adventures), Benn Beaton (Dust Adventures), Benn Williams (Achtung! Cthulhu) and Tom McGrenery (Heavy Gear: Space Vehicles Compendium, Feng Shui: In Your Face Again, Core Command: Player’s Handbook).